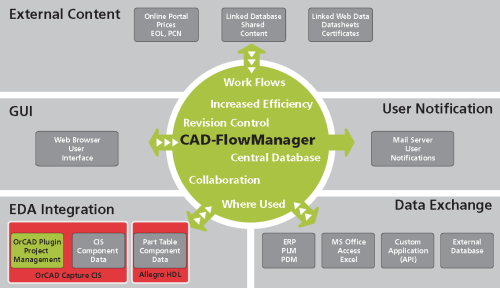 CAD-FlowManager enables sharing information between eCAD and corporate data (i.e. PLM, PDM, ERP) offering benefits for both design engineers and product life-cycle managers. It enables an effective collaboration between them without adding unnecessarily work as engineering overhead. A clean and centralized eCAD part library saves time during the part selection process for the engineers and it avoids creation of redundant parts. Adding and maintaining new parts over its lifetime might cost 500 to 5000 Euro per part depending on its complexity and the number of people involved in the verification and maintenance process. Corporate data access and performing global corporate functions within the OrCAD/Allegro interface improves efficiency and eliminates problems that can arise from managing eCAD data in a local file system. This deep software integration improves team collaboration, data quality, and engineering productivity to increase enterprise efficiency. CAD-FlowManager automates processes of publishing eCAD design information into corporate data platforms, making a process efficient and consistent. It literally takes just a single mouse click for engineering to provide design intelligence needed to drive decisions relating to procurement, supply chain management, engineering change management and other key areas throughout the product life-cycle. CAD-FlowManager enriches the eCAD library with critical enterprise data in key areas such as cost, change notifications and availability. This enables design engineers to make better part selections from within the eCAD tools and reducing costly rework later in the development process. BOM information is critical to managing the success of a new product. Without current and accurate BOM information driving the PLM system, it’s impossible to make optimal purchasing and other choices. 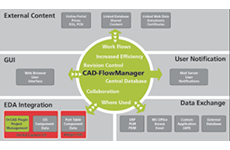 CAD-Flow- Manager provides direct integration with the Cadence design environments to extract relevant data that will enable collaboration, increase visibility and drive better product decisions. CAD-FlowManager offers a web based environment for easy deployment and configuration to your engineering and business process.